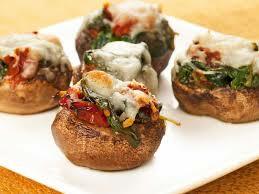 These stuffed mushrooms are so juicy and have a sensational texture. Try to use tomatoes, mozzarella and onions that are the same diameter as the mushrooms, so they fit snugly into the caps If you have some truffle oil, then add a splash to intensify the mushroom flavour. Cut the stalks out of the mushrooms and discard. Brush the caps with olive oil and put, gill side up, on a plate or tray. Season with sea salt and pepper and drizzle the truffle oil onto the gills. 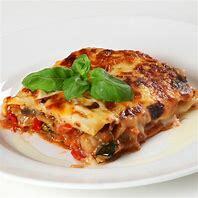 Put a slice of onion inside the cavity of each mushroom, then layer with a slice of mozzarella, a basil leaf and a slice of tomato. Season with sea salt and pepper, sprinkle with the finely sliced basil and drizzle with olive oil. Cook on a hot griddle pan for about 15 minutes, without turning, until the mushrooms have softened and shrunk slightly and the cheese has melted.